Happy Friday, friends! Do you have any exciting or relaxing plans for the weekend? I have a couple of fun days ahead, and I’m excited to have a little breather after a crazy week, too. I woke up yesterday thinking that it was Friday and it took me quite a few minutes to realize that it was actually Thursday, so I think I’m more than ready for this weekend. In honor of this wonderful day, I thought it’d be fun to do a light-hearted round-up post of some of the things I saw around the web that I loved from the week! 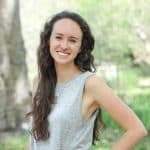 -Emily’s post about “Prioritizing Self Care.” She made some great points about how we tend to glorify busyness, and how sometimes, we need to take some time off to rejuvenate– no shame in that! Plus, she’s a fellow college blogger. -21 Food Phrases That Need to Die- I’m not a huge fan of saying “sammie” for sandwich, but I’m definitely guilty of saying yummy. Do people actually say some of these other ones? Who calls a sandwich a “sando”? Or calls their pizza “za”? -Rachel’s “Nifty Find of the Week” post where she featured Healthy Liv! She’s really sweet, and she writes an awesome blog while she’s a high school student. -Faith’s post about her history with food. Even if we don’t realize it, we all have a story of how our relationship with food developed (whether it’s good, bad, or even just neutral), and she does a great job telling hers! She also posts tons of delicious vegan recipes, if you’re into that. -Morgan’s post about staying motivated. She has some great tips! And speaking of motivation…we’ve been learning about motivation in my huge (400 person) psych class this week and our professor (this cute little 4’11” lady) threw this into her Powerpoint. Too funny! -Christine’s 4 Ingredient Fudge Brownie Truffles– This one wasn’t even technically from this week, but I haven’t been able to stop thinking about this recipe! Brownie truffles? I die. Christine posts the best recipes and she’s in college, too! -Georgie’s post about How to Make a Smoothie Bowl– A smoothie so thick you can eat it with a spoon? Sign me up! -This guy’s treadmill dance to Uptown Funk. I consider a treadmill run to be a success if I don’t come close to flying off the back of the belt, so needless to say, I’m pretty impressed. -This picture- I saw it on Twitter yesterday and it made me laugh. 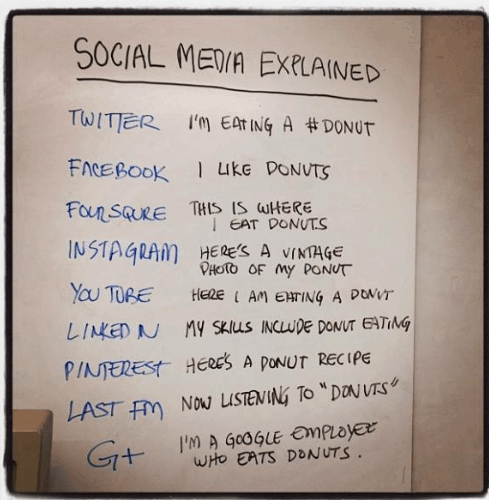 Social media for dummies and/or donut lovers. That’s all I have for today– I hope you have a great weekend and I’ll plan on checking back in on Monday! 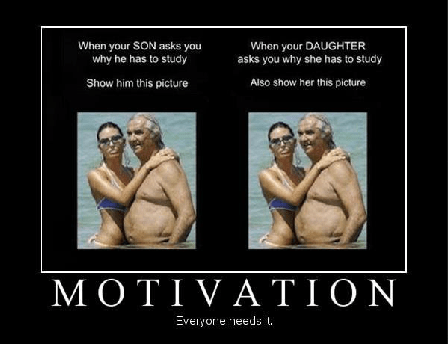 Lol – that motivation picture! Thanks for the morning laugh 🙂 Have a great weekend, girl! Hope you have a great weekend, too, Kate! Also, that Motivation picture is hilarious! Also, that food words & phrases article…I didn’t even know people called sandwiches “sandos!” What is that?! Haha. Have a great weekend! Seriously, sandos?! Hope you have a great weekend, too, Emily! I totally agree on Thursday feeling like Friday this week! It seems like the weekend can’t get here soon enough. I am totally guilty of calling my pizza ‘za in the past. Whoops! Hey, at least ‘za isn’t nearly as bad as sandos haha! 😉 Hope you have a great weekend, Angie! Thank you so much for featuring my post Liv! This means the absolute world to me :)! No problem, Rachel! I hope you have a great weekend! I totally thought it was Friday yesterday too! Busy weeks just put me into a fog sometimes haha. I say “yummy” probably almost on a daily basis..whoops :). I will say, one of the things I don’t understand and maybe it’s just where I’m from, but when restaurants call their pizzas, pies. I feel like no other food deserves to be called pie unless it is indeed “yummy” pie ;). I loved that guy’s video. Very impressive, I don’t even want to know what would happen if I attempted that! I think low-key weekends are sometimes the best kind 🙂 Hope you have a relaxing next couple of days, Emily! That last picture is hilarious – perfectly describes social media! You and me both! It looks like a lot of fun, though (minus the falling/face busting part) haha! The word sammie is like nails on a chalkboard to me! I’m glad I’m apparently not alone. The motivation, video and tips are fantastic. Made my night! I LOVE UPTOWN FUNK. Like you probably wouldn’t want to be my friend if you knew how much I listened to it. Also, your super short professor sounds adorable! Since I’ve listed to Uptown Funk 3 times tonight, I think it’d definitely make me want to be your friend more- haha! Thanks for sharing, love! I need to send you some of those brownie truffles ASAP. THEY WERE SO FREAKIN GOOD. And love the motivation picture hahaha. Your teacher sounds awesome. How big is your school? At UCSB we have classes with 900 people in our biggest lecture (intro to bio). Phew, 900 people?! 400 people is the biggest class I’ve ever had at UNC, and I thought it was huge! I discover a new person that I know but didn’t realize was in the class with me almost every time hahaha. I’ve had a couple other lectures with 100-200 people, and then some of my classes are just 30 people or so. ha! 🙂 thanks for the fun links! I saw that post on phrases that need to die as well and I have never heard anyone call pizza “Za”. it sounds so ridiculous.